Booktrack, a company that adds movie-style soundtracks to books, has become a Google for Education partner by offering a free Booktrack Classroom version for schools. The idea is to better immerse students into the text by adding sound effects, music and other forms of audio to the material they're reading. As one teacher explained, "Students have fun searching for sounds to add to their essays — the cacophony of music, sound effects and student laughter was music to my ears." Katherine Baker, a high school English teacher at Southern Regional School District in New Jersey, has made several lessons available in the Lesson Plan Library for the service, one for Homer's The Odyssey, another for Shakespeare's Romeo and Juliet and a third for The Adventures of Sherlock Holmes. "Booktrack is the only tool that I've found that really helps students connect with author purpose and tone in writing," she said in a prepared statement. Teachers register on the site and add a class, designate individual or classroom passwords, along with student names. To use the service, teachers and students log in and gain access to a text library with public domain books and chapters or upload their own stories. 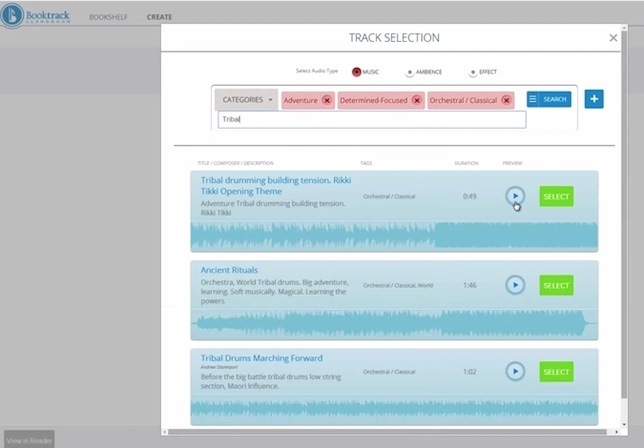 To add the audio, the users choose text and then specify music by emotion, genre and style or sound effects. The sounds are synchronized to the text and can have fade in and fade out effects. The program also includes a gallery of free images that can be used to add a customized cover to the text. A reading speed indicator can be customized. Once books are complete, users save them by choosing the Publish tab to send them into a classroom library. Free iOS and Android reader apps allow users to read the texts on a mobile device. Booktrack Classroom works on Google Chrome, Firefox and Opera browsers. According to research, the addition of a soundtrack to text can increase comprehension and encourage students to read for longer periods. A commissioned study in 2014 at the University of Auckland in New Zealand, where the company started, found that among students aged 10 to 14, those who read syllabus text incorporating Booktrack's synchronized soundtrack spent 30 percent more time reading the text and registered 17 percent higher comprehension compared to a control group.